Woot woot! It's Friday! YAY FRIDAY!! Since St. Patrick's Day is right around the corner, I figured I'd better get on a theme mani. A few weeks ago, I tried my hand at plaid, and figured this was a good a time as any to give it another go. Gradient: I used the makeup sponge technique, using Paper Mache and Mackenzie. 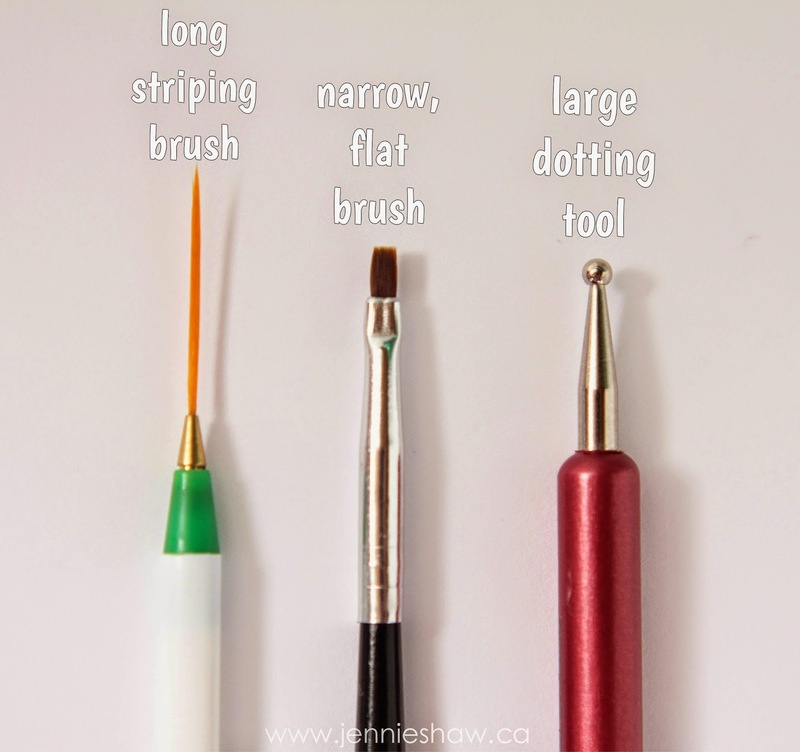 Click here to watch the tutorial I did, a while back. Plaid: When the base coat of Paper Mache was dry (two coats), I got out the narrow, flat brush and used Mackenzie to make the off-centre cross. When that was dry, I used the gold Stripe Rite to make the thin line. I let that dry for a while, and then used a long striping brush, along with Payton, for the final off-centre cross, in the lower portion of my nail. Argyll: When the base coat of Paper Mache was dry (also two coats), I used Payton and the same long striping brush to make an "X" from the bottom corner, to the top. I switched to the narrow, flat brush to fill in the upper and lower triangles. The nail art brushes don't hold polish as well as brushes that come with bottles, so I did two coats for better coverage. When that was dry, I used a large dotting tool to make hearts, using the corners of the triangles as boundaries. After I'd done all four hearts, I used the dotting tool to blend them together, hiding the spots where they didn't quite connect. Then, I got out the gold Stripe Rite to create the accent lines. I thought the clover needed more definition, so I used the long striping brush and a little bit of Mackenzie to add petal lines. I'm getting better at straight, freehand lines, so I'm happy to report that practice makes perfect. Or, almost perfect, as there's still some wavering. Haha! Still, it's a definite improvement. And using a narrower flat brush for the plaid worked really well. For the size of my nails, this is the width I'll use in the future. I love having plaid and argyll in the same mani, and the gradient nails make for a nice background, without being boring. All in all, I think this mani's pretty cute! I have the gold 4 leaf clover stickers so I'm trying to figure how I want to wear them. Decisions, decisions. Aw, man, I LOVE your argyle! You make it sound so easy, too! I need to start writing down all the different designs you keep inspiring me to try, so I stop forgetting them. McKenzie is a great color (reminds me of Printcess Rescue! ha!) and looks great as a gradient. Yay for holiday excuses to make manis! I totally love this look. Everything about it. 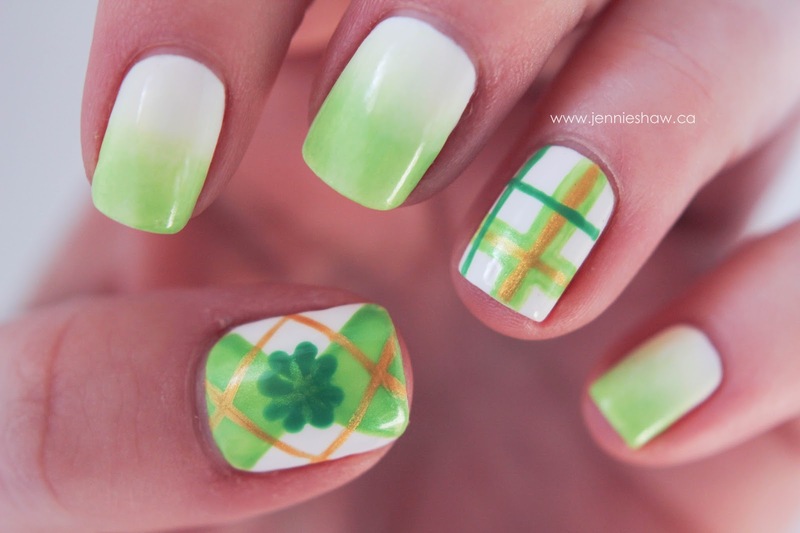 I think I'm going to do my nails on Sunday for St. Patrick's day. All of my gold glitter polish is dried up. So it looks like I won't be using that. 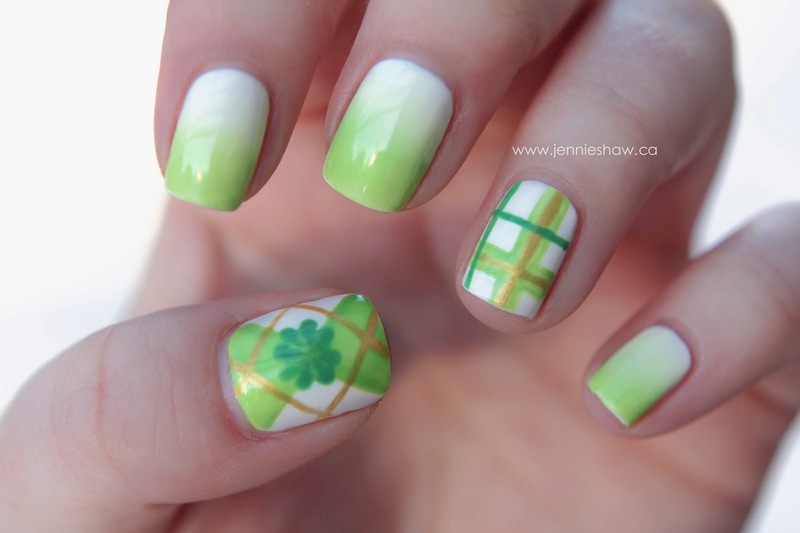 Gahhh this was perfect for St. Patrick's Day!! I really love the argyle and plaid, the details are amazing! !